Melinda Kralj, Curator of Collections, leads a tour. Touring the Arboretum The Arboretum offers many wonderful opportunities for exploration and learning for all ages, backgrounds, and capabilities. Free tours are offered with admission the first Saturday of each month (no advance reservations required); meets promptly at 11:00am in front of Norrie’s Gift Shop. We highly encourage school groups to plan a self-guided visit to the Arboretum. Instructors are welcome to utilize any of our printable resources below, to facilitate a fun and educational experience with children in the gardens. Bring a picnic lunch to the Arboretum! There are picnic benches in several parts of the gardens (see map below) and several open, grassy areas, where school groups can sit ​on the ground for lunch or for ​instruction. Please, no climbing on rocks in the Arboretum, they are part of the design and protection of the botanical collections. * Please notify the Arboretum if your group consists of 4+ cars or a bus, as parking can be limited​. Due to ​high demand, school group tour applications for Winter and Spring are now closed. If you are interested in booking a children's tour in Fall 2019, please check back here in August for the revised application. 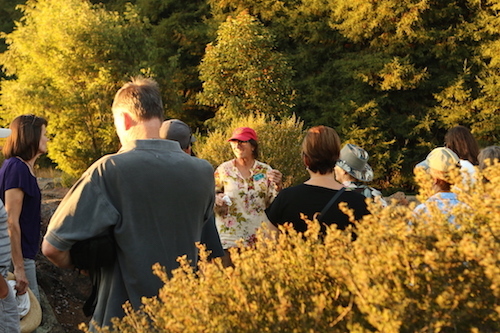 ​At this time, we have limited capacity to offer docent-led tours for adults. Cost of Docent-led tours for adults is $10/person. Please complete the questionnaire below, to be placed on a waitlist. If we have an opening that fits your request, we will contact you to make arrangements. As always, we encourage you to visit the Arboretum and bring along some of the ​printable online resources listed above. To get on our waitlist fill out this online form. Tour requests must be made a minimum of three weeks before the requested date(s), and no more than three months in advance. Tours in Spanish may be available by special arrangement. Se hace tours en español. No Community Day or member discounts, sorry. Tours usually take 60-90 minutes.